Adam Flamholc, from Malmo, Sweden put together an impressive streak of runs at Santa Pod Raceway over the weekend to take an impressive win at the FIA 2010 Final Pro Modified round. Flamholc and team took their G-Force Race Cars built 67 Camaro to the second qualifying spot with a 6.04 @ 236 MPH pass. 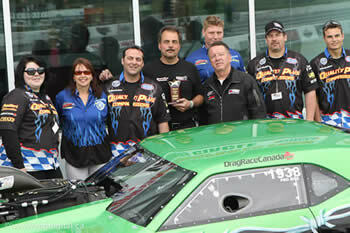 This was the highest qualifying spot for Flamholc and team to date in FIA Pro Mod competition. With the car consistently making full laps the team knew that they would be in good shape coming into Sunday’s elimination rounds. That proved to be right on with Flamholc blasting down the quarter mile with a 5.98 second run at 236 Mph to take the first round win. In the quarter finals Flamholc proved once again that the 5.98 was for real by improving to @ 5.96 at 238 mph. The 5.96 run now stands as the new FIA European National Record for Pro Modified. Flamholc continued his slash through the field by beating Johan Lindberg in the semi final and Bruno Bader in the final round to claim the event win. An excited Flamholc stated, “This is a dream come true……..my team has worked incredibly hard for this. We have built our own engines in house now and have been testing the car as much as possible lately. I want to thank Jim Salemi (G-Force Race Cars) and Jon Salemi (Resolution Racing Svc) for the guidance and help with our tune up. We have a very happy race car right now! I’m really looking forward to the 2011 season. It can’t come soon enough”. With the 2010 Season complete Flamholc and his team will re group over the off season and be ready for the main event in May of 2011. Flamholc's win elevated him to 3rd in FIA Championship points for the 2010 season. Flamholc thanks all of his team’s sponsors and supporters including Amalie Oil, MMR, Autoshop, ÅF, TURCK, Custom Graphics, Performance Plus, Husby Platslageri, Sunoco Race Fuels, Jimmy Rector, Mike Canter, Taylor Lastor @ T.R.E. and Motorenova. 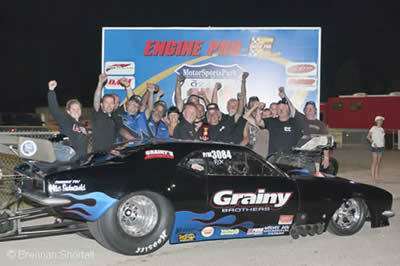 The G-Force built 68' Firebird of Mike Stawicki once again sets a new Canadian record while qualifying number one at the PMRA Stratford Spectacular Hot August Nationals this past weekend. With a 5.739-second pass at 254.23 mph, the MSR Performance powered machine posted the quickest pass in Canadian history, while being only one one-thousanth of a second behind the all-time record set by Scotty Cannon at 5.738 seconds. Stawicki is currently leading the PMRA points standings going into the last event; "Thunder by The Beach" at Grand Bend Motorplex where they will also finish out this past weekend's rain delayed August Nationals. The Stawicki Racing team thanks all of its supporters: G-Force Race Cars inc., MSR Performance, Resolution Racing Services, Isolation Systems, Cynergy Composites, Scott Jahren Paint, CG Composites, M/T Wheels and Tires, KW Motorsports, NGK Spark Plugs, Mastin Eng. And Hot Rods by Burke. Mike Stawicki and his G-Force Race Cars Inc. / MSR Performance 68’ Firebird had a strong performance this past weekend for the PMRA / Canadian Nitro Nationals. Stawicki reset both ends of the Canadian record book with a 5.803 @ 255.15 mph. The G-Force Race Cars team posted a string of sub 6-second runs including backing up the 5.80 with a 5.82 @ 254 mph. The 68’ Firebird made it to the semi's before engine trouble forced an early exit to the weekend. Stawicki stated, “We approached this race with a different outlook being that we have not run our screw blower combination in the quarter mile. Needless to say we are happy with the results but know we have a lot more work to do to improve this combination, but hey that’s the fun part of this racing”. Stawicki and team currently reside in the 3rd spot in points for the Canadian based Pro Mod Racing Association. Next up for the team is the IHRA Nitro Jam race in Grand Bend, ON. July 16-18. The Stawicki Racing team thanks all of its supporters: G-Force Race Cars inc., MSR Performance, Resolution Racing Services, Isolation Systems, Cynergy Composites, Scott Jahren Paint, CG Composites, M/T Wheels and Tires, KW Motorsports, NGK Spark Plugs, Mastin Eng. And Hot Rods by Burke. With a $10,000 purse on the line at Grand Bend Motorplex over the weekend, The G-Force/MSR Performance team of Mike Stawicki and Jim Salemi headed north of the border in search of a win. The one day Pro-Mod shootout during RPM Magazines Power Fest weekend event was a huge success and a great win for Stawicki. Qualifying in the # 1 slot with a 3.914 @ 193.25 mph the G-Force built 68 Firebird of Stawicki advanced through the ladder defeating Vito Montesano, Gary Irving, and Paul Noakes in the final. Co-Crew Chief Jon Salemi stated, “We have been making a lot of runs with this new Outlaw Pro Extreme car and there is nothing like getting laps. We tested on Friday and ran some low 3.80’s which we were happy with for the conditions. But once race day came around Jim and I were just focused on making the car consistent, racing smart and making trouble free runs”. The team did just that making runs between 3.89 and 3.92 to take the trophy to American soil. Team driver Mike Stawicki stated, “We have been trying to make as many laps as we can of late to learn what this car wants to be consistent, so we can make it a quicker car. We are getting there”. The G-Force/MSR Outlaw Pro Mod will continue its march next week at the PMRA event at Toronto Motorsports Park then to hopefully compete at the rest of the ADRL events for the season. The Stawicki Racing team thanks all of its supporters: G-Force Race Cars inc., MSR Performance, Resolution Racing Services, Isolation Systems, Cynergy Composites, Scott Jahren Paint, CG Composites, M/T Wheels and Tires, KW Motorsports, NGK Spark Plugs, Mastin Eng. And Hot Rods by Burke. Mike Stawicki Racing of Medina, NY and the G-Force Race Cars team are headed to Cecil, GA this weekend for their 2010 ADRL season debut at South Georgia Motorsports Park. Sporting a new lightweight Cynergy Composites 68' Firebird, powered by a 521 c.i. MSR Performance built Hemi, Stawicki and team are planning on making a statement this weekend in Georgia. "With this new body, and some horsepower we found over the winter, this G-Force car can definitely be a factor this weekend. We just need some time testing that will hopefully go smoothly. We are extremely excited to get the car out on the track, get a little testing in and really start working on a proper combination with the screw blower and lighter car.” Although missing the 1st ADRL race of the season, Stawicki and team plan on running the rest of the races through the season as well as a couple other local PMRA events. Stawicki Racing thanks the following companies for their continued support. G Force Race Cars Inc, MSR Performance LLC, Resolution Racing Services, Cynergy Composites, Victory One Performance, Strange Engineering, R&R Racing Products, M/T Tires and Wheels, DMPE Inc, Crane Cams, NGK Spark Plugs, Ross Racing Pistons, Scott Jahren Paint, Ram Jet Racing Products, CG Composites, Dan the Sign Man, and Burke Designs. Photo courtesy of Pumice T.
Robert Joosten driver of the Pro Dutch Racing (FIA European) Pro Mod is currently stateside picking up his newly built G-Force Race Cars 70.5 Camaro. The 70.5 Cynergy Composites Ultra light Camaro body will be the first of its kind in the Europe. This slick new ride features an Oddy’s Automotive built 526 cu in Hemi power plant by Billy Leverentz. Joosten, a national event winner in Europe is excited about his new opportunities and new car. He states, “This has been a great business adventure working with both G-Force Race Cars and Oddy’s Automotive, actually pretty painless. I can’t wait to put some test laps on the new hot rod this week before going back to Holland. We have all the right pieces to go fast, let’s hope we can make all the right tuning decisions to get it down the track! The Pro Dutch Racing team plans on testing in the Carolina region this week before heading across the pond for the FIA opener at Santa Pod Raceway in mid May. Pro Dutch Racing would like to thank all of their sponsors and supporters including, DJPS, Total, R inc, G-Force Race Cars, Oddy’s Automotive and Scott Jahren Custom Paint. Photo courtesy of G-Force Race Cars Inc. Although not taking home the win, Daniel Gregorini, of Perth Western Australia, has every other reason to hold his head high. What ended up being a very long weekend for Gregorini and his team, he did end up with a few high lights. In the quarter finals Gregorini stormed to a record setting run of 6.15 seconds @ 231.36 mph in his G-Force Race Cars built Scratch n' Match AA/AP Camaro. However while negotiating the shutdown, oil made its way under the tires as the chutes deployed sending him into Alistair McClure's lane. Luckily for Gregorini, after spinning around and coming to a rest in the other lane, McClure was able to narrowly miss the Camaro only causing damage to Gregorini's parachutes. Unfortunately, an engine problem forced Gregorini to miss the next round of eliminations; therefore he was not able to back up the 6.15 elapsed time for a new record. This puts an end to the Scratch n’ Match season for the 09/10 year, Gregorini states, “ I’m just very excited to have improved on my personal best from last season. I really have to thank my family for the opportunity and of course to all of my crew guys. They are the best. A special thank you must go to Jim Salemi of G-Force Race Cars inc. for his guidance and willingness to teach us to make better runs”. Gregorini and his team are looking at making the proper improvements to set up performance over the off season and continue to better the Scratch N’ Match team. When unlocking the doors to the shop today, the G-Force Race Cars Staff was greeted by a late Christmas present; the 1st production 69' Camaro from Cynergy Composites. The long waited, and highly anticipated 69' has created much talk throughout the racing community. Weighing in at a mere 48 lbs, it is the lightest and strongest 69' on the market. Completely designed from the ground up, this body brings with it features and details not seen before in race car bodies. We will let your eyes tell you the rest of the story. The body belongs to Jay Santos of Halton Hills, Ontario, who will be competing in PMRA and ADRL action next year with a Screw blown Hemi built by Mike Stawicki’s MSR Performance. Adam Croker, of Perth Western Australia, set a new record for roots powered doorslammers in Australia by running a 6.02 @ 240 mph in his G-Force built 68' Camaro at the Boxing Day event at the Kwinana Motorplex. This re-sets both ends of the record previously held by Sean Misfud. Croker and his team are systematically chopping away at refining the tune up on the new Top Doorslammer entry. “We are happy to say the least. We just have been learning now to run the new car and making small moves to make more efficient runs. Darren Mayer from DMPE Inc has guided us with our tune up direction and things are working out well. I’m getting more comfortable with driving and the team is just starting to gel together, its fun.” Croker states "the car drives unbelieveable, its the smoothest I have driven." Croker takes to the track again in two weeks for “Round Two of the Nitro Cars in Kwinana” to try and dip into the 5-sec zone. Stay tuned for details. Croker Racing would like to thank Pirtek Fluid Transfer Solutions, National Tyres, Mineral Haulage and Earth Moving, Link Low Loaders, United Fuel Injection, EquipRent, Action Mining Services, and G-Force Race Cars Inc.
the agonizing task of not catching the fuel lines or injector hat with your tow strap. This results in a safe and quickly accessible location to tow from. Ed Hoover and the Trussell Motorsports team dominated the weekend at the IHRA Canadian Nationals at Grand Bend Motorplex. Hoover topped the qualifying order with his G-Force built 68 Camaro, all while resetting the speed record early on Friday night with a 6.021 @ 240.68 mph elapsed time. Ending the qualifying session in the 3rd slot with a run of 5.999, Hoover was confident of a good weekend. Making his way through the field, he found himself in the final against the point’s leader at the time Kenny Lang. However Hoover was able to get off the line first and run a 5.988 @ 239.19 mph to Lang’s 6.025 @ 237.75 mph giving him the win, and the current points lead by 11 points. A double showing of Pro-Mods at the Grand Bend Motorplex proved to be an exciting weekend for fans, with the PMRA running along side the IHRA class. The G-Force Race Cars built 67 Camaro of Jack & Sonny Grainy proved to have a good combination throughout the weekend. Qualifying in the number 2 spot with a 4.031 @ 179.97 mph, the Grainy Brother’s team was looking to strike with the Lethal Weapon II! However a hard shake during the semi’s put the Grainy’s on the trailer, but not before setting low E.T. of the event during the PMRA Challenge with a 4.003 @ 182.92 mph. Pete Farber might have made a couple shakedown runs in his freshly built G-Force Race Cars 69’ Daytona at the last PMRA event. However that didn’t compare to this past weekend at New England Dragway. Farber found himself qualified in the 2nd slot, and paired up against John Russo in the Chicago style event. With a 1.01 60’, 2.69 330’, 4.03 @ 184 mph, and 6.19 @ 219.65 Farber was able to drive around Russo for the win at the major season opener of NED. After the 32 hour and 11,500 mile flight from Perth Australia to Buffalo, NY Adam Croker was finally able to peer at his G-Force Race Cars built 68 Camaro in person. “It gets tough only being able to look at pictures on the computer of the progress of your car.” Croker stated, “With that kind of money hanging out, you want to be able to drive over to the shop and make sure the seat is the way you want it, or the pedals are in the right spot and the chassis is the color I wanted it!” Croker was nothing but ecstatic at the quality of work and craftsmanship of the complete car. Croker said as he was speechless at the show quality fit ‘n’ finish of every part and piece found on the car and the Scott Jahren Paint was better than the rendering. Croker would like to thank G-Force Race Cars, Scott Jahren Paint, and MSR Performance (Mike Stawicki), and DMPE Inc. Once the engine has been repaired, the car will be taking a 6 to 8 week trip over the Worlds Oceans home for its debut race in Perth Australia late in 2009. 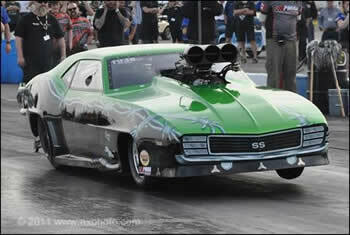 Mike Stawicki Racing had a successful ADRL debut at last weekends Gatorz Ohio Drags in Norwalk, Ohio. Stawicki’s G-Force Race Cars inc. built 67 Camaro was one of five roots powered Pro Extreme cars to qualify and the only IHRA legal car to make the field and advance into second round. Stawicki stated, “This is a fun deal over here at the ADRL. The amount of track time you get to spend in a two day period is great. The competition is stout in all classes in the ADRL. The staff was glad to have us and made us feel welcome and we ran well. All in all, it was a good experience”. Stawicki qualified in the 10th spot with a 3.98 @ 187 Mph and he took out Gary Irving in the first round with a 4.02 @ 185 Mph. That win paired him with Bubba Stanton in the Widowmaker Corvette. Stawicki put a slight holeshot on Stanton .036 to .047, but Stanton’s screw compressor power drove by Stawicki at the 200 ft. mark with 3.86 @ 195 Mph to Stawicki’s 3.97 @ 185 Mph. Co-Crew Chief Jon Salemi confirmed “We came to this race to improve on getting our car down the race track with our new M5 Supercharger. Between the new blower and clutch combination, we have a great race car right now. We are really excited about our upcoming events.” The team will travel to Grand Bend, Ontario next weekend to compete in the 3rd Annual Thunder by the Beach PMRA Event Aug 30-31 followed by the IHRA Amalie Oil North American Nationals September 5-7 in Epping, New Hampshire. Stawicki Racing would like to thank the following companies and people for their continued support: G-Force Race Cars Inc. Darren Mayer & DMPE Inc, Stawicki Used Cars, Isolation Systems, Strange Engineering, Weld Racing, NGK Spark Plugs, Mastin Engineering, Hot Rods by Burke, Cynergy Composites, Scott Jahren Paint, and 1320 Web Services. Congratulations to Jack Grainy and Grainy Brothers racing for their runner-up finish at the 3rd Annual Eaton Challenge PMRA event at Sanair. It was a long drive for the team but qualifying number one with a 4.29 E.T. and a runner-up finish definitely made it worth while for the Grainy Brothers. Although they broke in the final, Jack was pleased with their performance, “We’re real happy with our new car this year,” said Grainy. “I want to thank everyone at G-Force Race Cars, Mike Stawicki for his engine work, Scott Jahren for his paint work on the car, Jon Salemi and DMPE for their supercharger work, Refreshment Supply and especially Jim Salemi for all of his help.” Next stop for Jack and the Grainy Team is the ADRL race in Norwalk Ohio August 22-23. Ed Hoover driver of Paul Trussel’s 67 Camaro Pro Mod, built by G-Force Race Cars Inc., won the single largest purse in Pro Mod history by beating a red lighting Mike Castellana in the final round of the Torco Race Fuel Pro Mod Shootout. The race which features the Top 8 qualified car throughout the season was held at the Torco IHRA Northern Nationals. Hoover disposed of Pro Mod stars Jim Halsey, Scott Cannon and Mike Castellana running between 6.13 and 6.07. Congrats from the entire staff at G-Force Race Car Inc. on a job well done. Veteran Pro Mod racer Mike Stawicki will make his first appearance at the ADRL Ohio Drags Presented by Gatorz August 22-23. Stawicki will race his IHRA legal ride against the screw compressor door slammers and is quite excited about it to say the least. 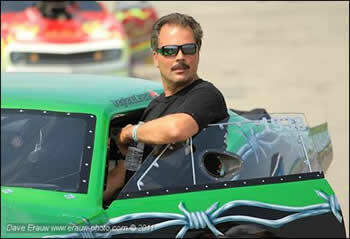 He states, “Kenny Nowling and his crew of people have assembled a great league over at the ADRL. We would like to race with ADRL more frequently but to be real competitive, we would need to change our car all around or just build a lightweight model. Neither of which there is time or money for at this point. If we are on our game we can run some mid to low 3.90’s which should get us into the show. The rest will be up to me!” Stawicki’s G-Force Race Cars entry has been as low as 3.902 in legal trim and hopes the cards fall right at the Ohio Drags in Norwalk. Crew Chief Jim Salemi (owner of G-Force Race Cars) exclaims, “This is how Pro Mod racing started. It will be fun to go back to that style of “Run What Ya Brung” style of racing. We also look forward to racing at Summit Motorsports Park. Both Mike and I have won major events at the facility so we are hoping we can make it happen again.” The team will take advantage of a match race this weekend at Toronto Motorsports Park against NHRA point’s leader Tony Pontieri to get a handle on the latest supercharger design from DMPE Inc. Stawicki Racing would like to thank the following companies and people for their continued support: G-Force Race Cars Inc. Darren Mayer & DMPE Inc, Stawicki Used Cars, Isolation Systems, Strange Engineering, Weld Racing, NGK Spark Plugs, Mastin Engineering, Hot Rods by Burke, Cynergy Composites, Scott Jahren Paint, and 1320 Web Services. Daniel and Peter Gregorini, from Perth, Western Australia will be taking delivery of their 68 Camaro in September of 08. The car is in process as we speak and will definitely perform as well as it’s going to look.Gregorini a paint and body man by trade will be applying the green livery that will adorn the state of the art doorslammer. Daniel says,” This has been a work in process for some time. We originally started with just a bare car which now has developed into a turn key deal. We will run the car in Australia’s Top Doorslammer contingent as well as AA/AP. Jim has guided us on the proper steps to take on the completion of our project and really look forward to the challenge ahead. We know we have our work cut out for us”. The Gregorini ride will feature a Jan Cen built BAE Fathead that was formerly between the rails of Joe Mulligan’s 68 Camaro Pro Mod. Here are some in progress pictures of this project. In Other Australian Top Doorslammer news Adam Croker, also from Perth Western Australia will be taking delivery of his new G-Force built Cynergy composites bodied 67 Camaro in late 2008. Croker, owner and operator of DMPE Down Under and the record holder for the quickest and fastest powered roots alcohol dragster, will definitely bring some swagger to the Aussie doorslammer contingent. Croker’s missile will be powered by a BAE Fathead VIII engine built by Stawicki Racing Engines and be topped by a DMPE Blower and fuel system. Croker states, “Jim has been a great pleasure to work with and has really listened to the differences of rules and such over here in Oz. This car is going to be able to take advantage of the “roots” powered Top Doorslammer rules over here. I can’t wait to get this car home.” Rod Burke from Hot Rods by Burke designed an awesome scheme for the car and Scott Jahren will be making the scheme a reality. Ed Hoover was a picture of consistency with his G-Force Race Cars built 67 Camaro at the recent IHRA race in Grand Bend, Ontario. Hoover dismantled the Field one by one with runs of 6.10, 6.11, 6.09 and 6.06 in the final over Tommy D’Apprille. Congrats go out to the entire Trussell Motorsports team.